Ready to start writing your welcome email series? Download my free cheat sheet of email content ideas to start planning! When I first got started with email marketing, I was only sending newsletters, which is a great start. I would send out a newsletter every other week, with no automation in between. But once I started getting new subscribers consistently in between newsletters, I realized what this was like for my audience. I was sending newsletters every 14 days and gaining 5-10 new subscribers per day. That meant if someone sat and binge read my blog for hours and downloaded a free resource or training and became totally obsessed with me, aka ultimate goals, they wouldn’t hear from me again for up to 13 days. At 10 subscribers per day, there’d regularly be up to 70 subscribers waiting a week to hear from me again after first opting in. That’s a LOT of missed opportunities to further win those people over, and turn new acquaintances of my businesses into total BFFs. By the time they finally heard from me with my brilliant, brilliant content, they cared about me WAY less than when they first signed up. I wasn’t taking advantage of the momentum from when new subscribers first started throwing heart eyes 😍 my way and signed up for my email list. Back then, it probably took wayyy longer than necessary to build a close relationship with my email audience. Sure, it eventually happened, but with a good welcome email series we could have really sped up the process, helped them more, and grown my biz faster. …And teach you how to set your own sequence up right away, of course! A welcome email series is an email marketing sequence someone automatically gets right when they first sign up for your email list. Any email marketing software worth its Salt n Pepa will let you create a welcome autoresponder, even if it doesn’t have lots of fancy automation tools. Even free tools often let you set up one account-wide welcome sequence. Personally, I use ConvertKit, but I’ll get more into that later. A welcome series is simple. It’s about getting personal, continuing momentum that’s already there, building a relationship, and setting the groundwork for an amazing long-term customer and BFF of your business. It’s simpler than a sales funnel email sequence and can be used alongside a dedicated funnel, where subscribers receive one and then the other. BUT if you haven’t worked out the exact funnels for your business yet, you can still use an email welcome series to gain new customers and nurture followers until they become customers. In fact, one of the most important times to have a really stellar welcome sequence set up is when you DON’T have a sales funnel or any email marketing automation running yet. It’s 100% the first email automation any online business should set up. 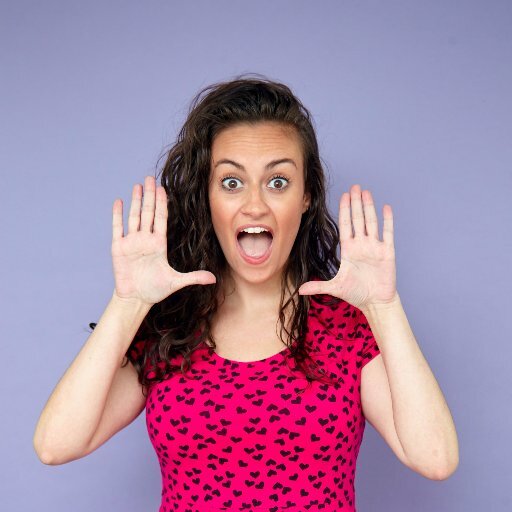 Why are welcome sequences SO awesome that you should postpone working on your sales funnel – the thing EVERY online business influencer can’t stop talking about – to get one running ASAP? When someone’s recently engaged with your content, especially in a way that requires making a commitment the way forking over an email address does, that’s a sign that they’re super interested in it. But they’re interested in it NOW. If you don’t email them again for weeks, that interest fades. They get distracted by other things. By the time you pop up in their inbox, they still like you, but less actively. That email may or may not get opened since they’ve moved onto thinking about other things. But when you email them again right away, and then again shortly after that, and then again shortly after that, you’re giving your new subscriber new things to engage with frequently enough that their interest won’t fade so fast. Instead, you just keep throwing more awesome emails they’ll love, making THEM love YOU, and becoming long-term BFFs with your business. I’ll talk more about this later, but your welcome email series should provide a way for you to learn more about new subscribers. For example, the first email in a series is commonly something asking a question and prompting the subscriber to reply back. It seems simple and natural – which it is. But it’s also EXTREMELY strategic. Replying is a new action that engages and actives your subscribers *even* further, and the more engaged, the better for the long-term. You can learn important things about your audience to help you shape your products, positioning, and future marketing – and get the insights to design those coveted sales funnels. With this running on autopilot and asking subscribers questions, you get a constant, automatic stream of audience insights. And I mean, that’s gold. Your welcome series is also a great chance for new subscribers to get to know you. Total bonding fest all around. They directly get to know your business when you include something like an email laying out your brand story in your email sequence, or when you share your social media profiles and old content that contains more details about you. But dripping out a lot of content to new subscribers right away also lets them get to know you indirectly as well through your writing. They get to know your brand voice, style, etc. Someone’s making a pretty big commitment when they sign up for your email list, compared to other ways of connecting, like a social media follow. We tend to allow way fewer people into our inbox space than our social media feeds. That connection is worth so much, but you still want to take it further. The more platforms you can connect with your audience on, the better. There are tons of calls-to-action you can use in welcome emails, and welcome content themes you can cover in them, that it’s easy to connect with your email subscribers everywhere else they hang out online. Finally, a welcome autoresponder that repurposes content lets you build your own “Greatest Hits” sequence. These people getting your welcome emails are brand new to your brand – they’ve likely seen very little, if any, of your own content. But if you’re like most businesses using content marketing, you’ve dropped a ton of awesome knowledge in the past that’s still super relevant to your audience. Your new subscribers will WANT to know about it, for their own good. So use your welcome sequence to drive subscribers to your older, best and brightest pieces of content. Whether that’s blog posts, YouTube videos, infographics, livestreams, etc. – any piece of content people really loved in the past is a great topic for an email in your welcome sequence. Now, don’t you see that these are SO awesome?! Use your welcome sequence to drive subscribers to your older, best, and brightest pieces of content. But before you drop everything (don’t drop your laptop or cell phone, please 🙄) and go create yours, keep in mind that there’s gotta be some strategy and intention behind it. Like everything great in marketing! I mean, I could say this for your overall brand voice – I do love a good, casual brand voice. But even if you normally take on a more formal tone, now would be the time to get as casual as your brand ever does. Your voice in a “getting to know you” email should be a little less buttoned-up than in an “official” newsletter email. Again, the whole point of these emails is to build a close and personal relationship between your brand and its subscribers. You know how you get personal? By talking like one person talks to another person. Plus, it’s a great idea to use your welcome emails to get people replying to you and having a literal conversation. To have a conversation, you need to be conversational. Again, we’re not writing newsletters here. It’s okay for a newsletter or regular email to bounce around a bit as long as it all stays within a theme. After all, you only send newsletters now and then – like every week or every month – so dropping a few things at once isn’t overwhelming. But welcome emails get sent way closer together than newsletters, so throwing five things at a time to your subscriber in each of them is MAJOR content overload. Think of your overall welcome series as ONE piece of content, instead of thinking about each email individually. The series overall can span multiple topics, but each section (or individual email) should then stay nice and tight. Don’t ask for people to read four blog posts and follow you on three social media channels, all in ONE email. Oh God, no, don’t do that. Instead, that’s, like, a whole welcome series right there. Think carefully about how you order the different emails in your sequence. Of course, drip information out in the order that people need it. If one email talks about how your story impacts how you run your business, you need to have already told them about your story. If you’re sharing some press coverage or reviews of your best products, it’ll help if you’ve already shown them your best products. Then on another level, be aware of how people tend to interact with email sequences. They’re most engaged at the beginning when they’ve just subscribed to your list (after all, that’s why we’re doing this). These emails help people stay engaged but realize they WILL start to drop off. The emails at the end of your autoresponder will be seen by a lot fewer people than the ones in the beginning. That’s just how it is. So you might not want to put the most important email in your sequence last. Like I mentioned earlier, it helps to think of your whole autoresponder as one big “thing.” Like a TV show season with each email being an episode (you should know by my #gifgame how I love TV 😝). And you know how helpful those “Previously on…” blurbs at the beginning of TV episodes are? SO helpful. Your emails need something similar to string the story together and catch your reader up to speed with each email. Remind them what happened last time before moving on to your story. Explain what the last email has to do with the next one. All it takes is a simple sentence or two. A lot of people have really complicated spacing and cadences for email sequences. Stuff like “wait 1 day between these two emails, then 12 hours before the next one, then 2 days, 3 hours, 32 minutes, and 10 seconds before sending out the next one. Don’t worry about spacing too much, you just want to find a good balance between consistent but occasional. Depending on how many emails are in your welcome series, I like to send the messages either every day or every 1-2 days. A shorter sequence can make great daily content for 4-5 days, but daily emails can be a lot the longer they go on. Instead, that’s when you might consider spacing them out more so that you’re checking in every few days over a longer term. 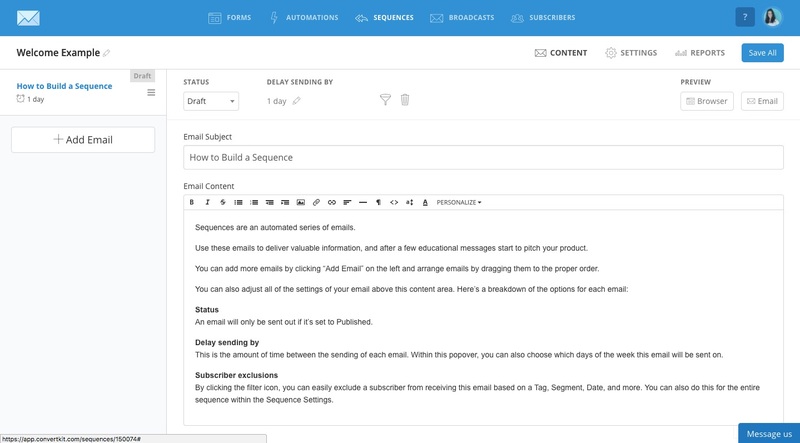 By combining this automated email sequence with other ones, like a sales funnel or automated newsletters, you can build a long-term, passive engagement strategy with your subscribers. A welcome sequence is especially great if you have more than one product with a sales funnel. When someone opts into your mail list NOT through a sales funnel, you can use your welcome sequence to promote those offers and guide people into funnels where you can convert them. Honestly, it depends. I know, that’s sometimes a sucky answer to hear. And a whole lotta complicated stuff like that. So instead of laying out an EXACT series for your sequence, I’m going to start with the staples you can build onto. These five ideas can each be their own email, multiple emails, or two (for example, the first and second ideas I suggest) combined into one message. Take these and complement them with other email content ideas that are more specific to your niche and audience, and you’ve got a strong as hell relationship builder! First of all, every welcome sequence should start with introducing yourself. Drop a note saying “hi” and introducing your business a bit before moving onto other stuff. This can be a longer email going into your brand story and creating an emotional connection. For example, explaining why you got into graphic design before going on to talk about your specific services in other emails. This is the tactic I like, and not because the email’s short. I like it because it prompts your audience to respond and share themselves with you. This creates a connection right off the bat and gets you great audience insights on the new people joining your email list. If you don’t ask a question to prompt some engagement in that first email, you def want to do it in other emails. Like I talked about earlier, getting people really engaged is crucial, and getting them talking helps you understand your audience in order to serve them best. Or anything else that helps you better meet their needs. You can also tie engagement questions into emails on other topics. Like in your introduction email, prompt subscribers to reply and introduce themselves. Or at the end of any other email, include a question asking for their thoughts on the topic. You also want to send an email or two driving email subscribers to engage with you on OTHER platforms. They likely joined your list through your website, but you’re dishing out greatness all over the internet. Facebook. Twitter. Instagram. YouTube. Anywhere your business is being awesome online, make sure your subscribers know about it. A lot of welcome sequences will include an email listing out the business’s social media profiles with invitations to connect with them. This is a great start! Even better is one or two emails dedicated to individual social networks. We talked about staying focused before, right? Try going into the specific value provide for an individual platform with a single, strong call-to-action to connect there. Next, you’ll want to make sure you’re sending new subscribers to old content. Emails repurposing old blog posts, videos, etc. I talked about this earlier. If someone just joined your email list, they probably found out about your business pretty recently. That means they haven’t read that completely, ridiculously amazing blog post you wrote six months ago. Either repurpose the content from some of your best pieces in the emails of your welcome sequence or use the emails to drive traffic back to the original pieces themselves. This is a great way to consistently drive traffic to these posts, and it shows your expertise and authority to new subscribers. They see your best stuff and build their impression of your business based on that. So please remember to include reminders of your products or services! You don’t even need to hard sell. Including a single email about products and services with a call-to-action to learn more elsewhere. Including a P.S. in each email with a quick link to your services or sales page. I like both, and as a subscriber, both have been enough to get me to convert as a customer, even without a “hard” sales funnel. Like I mentioned earlier, I use ConvertKit for all of my email marketing, so before we part ways today, I want to walk you through actually setting up one of these babies using their automation builder. 2. Adjust the “delay sending by” field to the sequence timing you want. 3. Enter the subject line and content for the first email in your autoresponder. 7. Add each form that you have leading to the welcome sequence, as a trigger for the automation. This makes it so that “all roads” lead to the autoresponder. 8. 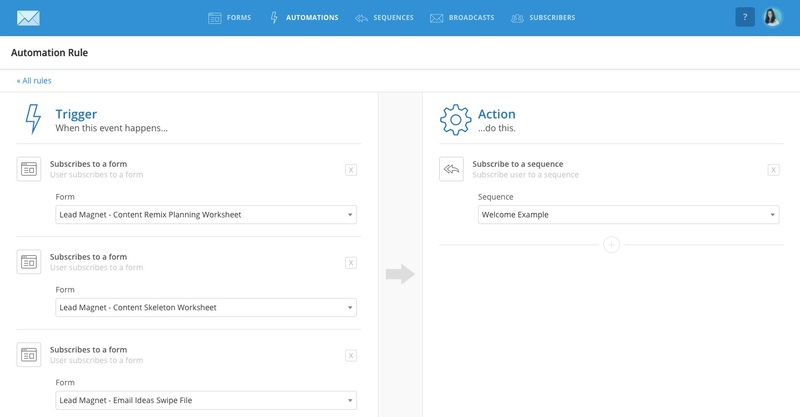 Add subscribing people to your welcome sequence as the automation’s action. 9. Save it, baby! You’re done! So, do you have a welcome sequence for your new subscribers? Let me know if the comments if you do or what you talk about in it!